Eight intrepid souls ventured out into the wilderness last Sunday. And, as you can see from the photo, they all made it to the Blue House in Vernonia for some yummy lunch. The weather was kind to us. Perfect temp for light jackets or less. Wind at our back on our return to Banks. This route is ideal for all abilities, just be careful and on the lookout for kids and dogs who litter a good portion of the route. Duane and Donna. Mondays have been getting nicer and so has the turnout for the Monday rides. The April Second Sunday Ride got cancelled due to questionable weather, but a couple of us rode anyway and it was actually a "fairly" dry ride. The May Second Sunday Ride (and final one), only had two teams show up. Maybe it was because it was Mother's Day, or perhaps it was due to the hot weather in the forecast. But it turned out to be a nice ride anyway, but maybe just a bit warm. We did our favorite ride, the Trolley Trail, and stopped at Spring Creek for snacks. The club hasn't skipped a Monday ride for quite a while and we've always had at least two teams. Join us if you have the time and want to ride. We had the nicest weather of the year so far to kick off our first ride of the series. 5 tandems showed up: a Calfee, a Comotion, a Land Shark, a Rodriguez, and a our newest members in club on their Santana. We had a nice ride out to Gladstone along the river and back along the Trolley Trail. We stopped for snacks at the Spring Creek Coffee Shop. 4 tandems. Trolley trail. Wet ride. 2 tandems. Nice ride up to mt tabor. Chilly 36 degree ride back down to OMSI. Three tandems and decent weather. We rode the Mt Tabor loop backwards and stopped for coffee in Ladds Edition. Mar 5. The forecast looked pretty good, but reality was a bit more damp. 3 tandems showed up for a misty ride up to mount Tabor. Feb 26. We came. We froze. We rode to the coffee shop. 3 tandems showed up and the weather was just above freezing, which was cold enough to invoke the "Coffee Shop Clause". So the official ride length was 12 miles. Feb 19. Too much snow and ice for all of us. We cancelled the ride. Feb 12. The usual fearless four tandems showed up for a beautiful morning, but chilly, ride. We rode out to the University of Portland and stopped at the coffee shop at Ladd Circle. Feb 5. We had 3 of the usual tandems. It was a nice day but a little overcast. We rode the Mill Market Main route. Part of the Gresham Fairview trail was closed so we had to improvise on the route. We stopped at the. Blue Kangaroo for snacks. Jan 22. It was a cold lonely ride on a dank day. Only one tandem ;-( So we rode the the Hotcake house for omelets and pancakes which brightened the day up considerably. Jan 15. Only two teams today. But it was was a nice clear day so we rode about 27 miles out to the University of Portland and back. Jan 8. We had three of the usual four; the forth took off for warmer rides in Australia. We had a major communication mix-up regarding starting point, but we finally got together at start of Springwater at Oaks Park and headed out about 9:30am. We biked east on Springwater out to Gresham and Jazzy Bagels. We rode the Springwater back afterwards. Jan 1. 2018 - New Year's Day fell on a Monday this year, so it was up to the Monday Morning crowd to lead a ride. We had a great turnout with 5 tandems (John and Valerie, Kevin and Val, Jane and Peter, Ted and Nancy, Ally and Alan) and George on his single bike. The weather was very cooperative. Because the morning the day before was a bit frosty, we decided to start the ride at 11:00 a.m., an hour and a half later than our regular start time. It was cold, but not freezing and not wet at all. There was an east wind blowing though, so the plan was to head south to the Trolley Trail. The wind always dies down past Milwaukie. We discussed the option of riding down the Springwater Trail to the Tilicum Crossing first and because Nancy commented she had never ridden across it before, so we added it to the plan. It turned out to be a really nice day for a ride. Very un-wintry. 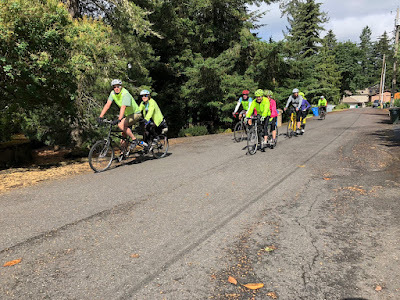 We took our usual rest stop at Bridge Park in Gladstone and headed back towards Milwaukie with hopes of stopping at our usual watering hole, the Spring Creek Coffee House. But they were closed for the holiday, so most of us went to the Mexican restaurant around the corner. The ride ended with a short 2 mile trip back to Sellwood Waterfront Park.